For being dialed back on Birdsoft in 2018, we have still managed to sneak in several enhancements to our product line and keep the ball rolling. We released our first Mac OS app into the App Store!! PokerTimer for Mac has been very well received. 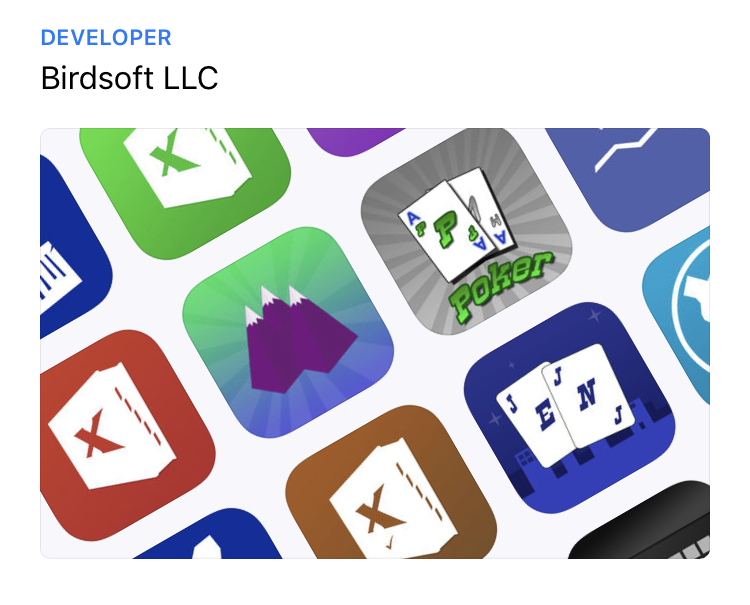 We had so much fun creating it based on our iOS PokerTimer, that itself is quickly approaching 250,000 users, we definitely want to do more for Mac OS. Extreme Agenda got a pretty nice update this year. More importantly, that codebase has gotten some much needed love in a bunch of other directions to use well in to the future. Watch for improvements in 2019 to make this powerhouse of an app even more versatile. And finally, a ton of work has been done on a new project(s) that we hope to show you in 2019. This will play a key part in the future of Birdsoft. In fact, with all the work that has went into this, ‘dialed back’ isn’t really correct for us in 2018. We are very excited to take the cover off of everything soon and show you that we still are passionate about making great apps. Thank you all! Happy 2019! P.S. There’s now an Apple Watch or two in the house, not sure what that means yet for our software, but it can’t be bad. This entry was posted in Birdsoft on December 31, 2018 by Administrator. So I’m in the rather cool position of working on Extreme Agenda 5.0 and also using the evolving product to plan the work to be done. So let this be a little preview of what is coming in Extreme Agenda 5.0 as well as the power it will provide. We have decided to double down on power features, and have some that only a handful of other apps may have, but you won’t find them all in one place like this. Our direction is now defining EA to be the premium app for organization with power and flexibility. It always has, but we want to make that a more solid position in the premium space. So a lot of this feature planning falls into our already powerful Reminder List, using a Getting Things Done(GTD) like system on the iPhone. Check out our older blog post on GTD in Extreme Agenda for more help. The first big thing is that we have made this list have 3 levels of sorting(effectively 4 as name is used as the last one if not used before). So our setup is to sort by Status( Actions like “Next Action“, “Planning”, and “Active“), then Completed, and then Priority. So as we move features we are adding in to groups like the Next Action group, we can have a few in the group and then use the tap-n-hold popup toolbar to change the priority to move them up and down the list. And with this setup the completed reminders drop down to the bottom of the current group. The second, and arguably one of the biggest new game changing features of EA 5.0, is that you can add lists to reminders and events. So now each feature reminder can have a sub-list built right in that I can access and check off as I complete the smaller pieces that make up the feature. We can’t begin to explain how handy this feature is. Wait until you see it’s implementation and uses. And best of all they are embedded into your notes, so they appear anywhere you look at the event or reminder. We also have added color to the flat icon set, and are using that to our advantage. Another way of grouping our new features is that we added several categories to the system based on size of the feature(approximately how many hours or how much effort). We set all of these categories to the same flat ruler icon(denotes size) but gave them all different colors. 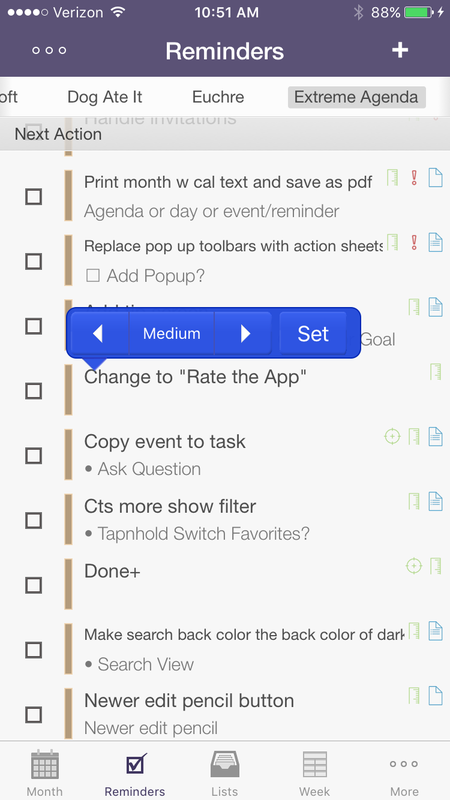 Now at a glance when looking at the reminder list I can tell by color whether this feature is Large, Medium, or Small. 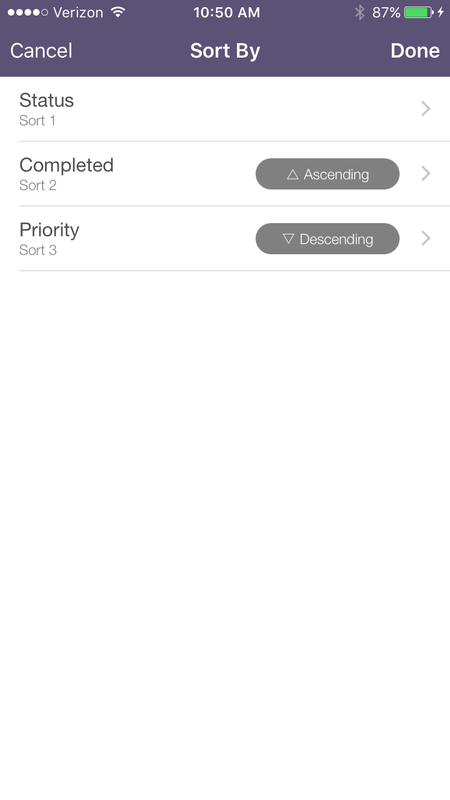 I can also re-sort based on category, status, completed, and see what is left for big chunks of time. And finally we are taking advantage of updates to the template system, so we can tap n hold the + button, select the template choice and then select a template from the list for say a “Small, Next Action, High Priority” reminder and fill in the name only, and we have a filled in reminder. So with Extreme Agenda 5.0, get ready to be even more organized. This is just the start of what new features are going in to version 5.0 to make it the best planner on iOS. This entry was posted in Birdsoft, iPhone, Productivity on March 18, 2016 by Administrator. Just a little update on where Birdsoft is…. We are very proud of our two brand new products launched in 2015. 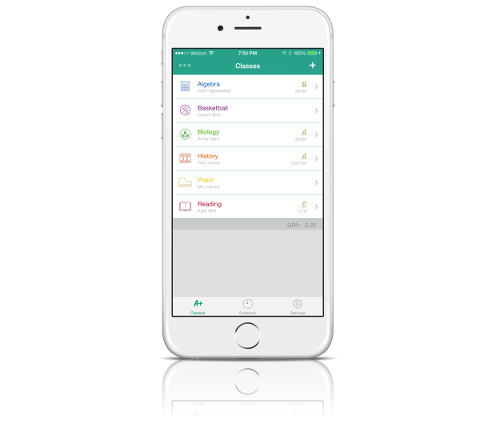 The Dog Ate It is a great full featured student planner that is built to feel simple and easy to use, but has as many if not more features than the current student planners that are established in the App Store. Unfortunately with the current problems in today’s Apple’s App Store, we can’t quickly bubble to the top and really prove that is true. So we could use your help to get people trying it, for FREE, and realize what a great tool it is for students in the classroom. Swim Track is an app that I just had to write personally, so I could use it for my own swimmer. I knew I wanted to see a graph of her progress in events in both her club and summer swim teams, and be able to handle all the conversions from yards to meters seamlessly. I started out writing it for myself, but then put enough polish on it, that it is pretty much the top solution on the App Store for doing just that. We hope to expand on our great UtiliForms offering in 2016 as well. We have some great ideas to really make it what every utility or service that serves utilities needs to quickly handle reporting in the field with super simple customizable forms that any of the crew can handle. Now Im had at work adding some great new features that will refine the Extreme Agenda experience. I have it updated for iPad Pro, have a couple bug fixes in there, and am now starting on 4-6 new features that at least in my main work flows, will make it infinitely more useable. A few of which are multiple sort levels in Reminders, adjustments to make templates even easier, and additions to the filtering to make that way more powerful. And a really cool feature that can make any reminder or event into a list…. We are bouncing around a couple other features like printing and notes on the calendar, to make it the most powerful Extreme Agenda yet…. 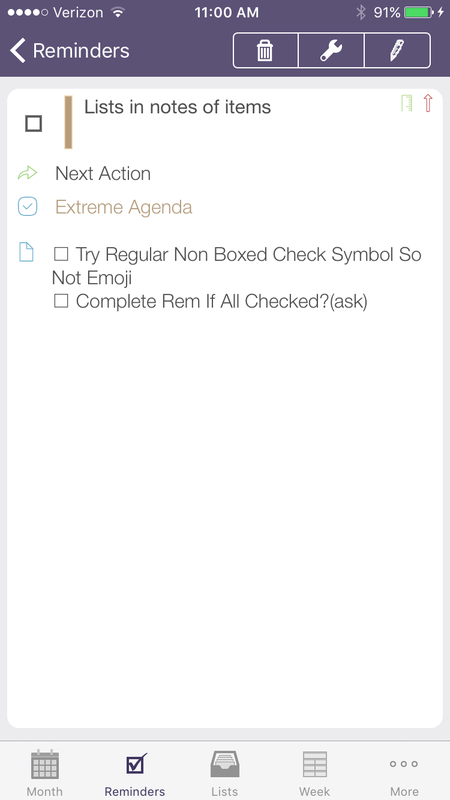 So watch for Extreme Agenda to get even better soon, we think with the changes we will have by far the most flexible Reminder List for Getting Things Done on iOS, and yeah, the top calendar too! And as mentioned earlier, today’s App Store is kind of a mess. And with the problems and all the competition out there, it has become very important that if you want to see continued advancements on a product you love, you need to help out us developers by spreading the word and adding positive reviews in the AppStore. It all helps so much and we really appreciate it. Birdsoft is happy to have some of the most loyal and outstanding customers and we thank you, and want to continue to find more great people to enjoy the time and quality we put into each App. This entry was posted in Birdsoft on February 5, 2016 by Administrator. Just in time for back to school…. We are pleased to announce the release of our new Student Planner for iPhone, The Dog Ate It. Having had a version of this app dating back to 2002 on Windows Mobile and later on Windows desktop, we always had it in our mind that we would bring a really cool new version of this to iOS at some point. We have watched this market since the start of the AppStore and while we liked what the one leader in this field was doing, we just felt it was always an app that was not quite organized correctly and had pieces ‘strapped’ to it in confusing ways in order to say they were there. There aren’t any other really good alternatives that do about everything you want(grading is essential for students, otherwise why not just use a good organizer), or aren’t dependent on online accounts. So this app has been in development for a long time. It was actually mostly done before last school year, but with our situation, we ended up taking a full extra year to polish it. We went in thinking we needed to strip the idea of the planner down and build it back up. We know students are going to be using it, for the most part, in the few minutes at the end of class or in between classes, so we wanted things to be right there, really clear, and really really easy to add and update quickly. We think students will love the design. Colors and icons play a prominent part in allowing you to quickly identify classes and see what you have going. Shortcuts are built in to allow you to quickly add, reschedule, or finish assignments. There are only a few main screens involved so you don’t sit and wonder which way the app was meant to be used. Jump to the schedule tab to see your week or month, or just look at your classes individually. And with our design we do have it ready to expand in several ways. Under the hood it uses Core Data, and actually has all the code in there to sync to iCloud. We just ran into some problems in testing and wanted to put out the most solid app possible at launch so pulled that temporarily, but allow you to email a backup of all your data. And we have plans that if enough students love it, we can quickly move to the iPad as well… And then sync will be more important…. And what about a notification widget and the watch and…. We do believe in features. Lots of them. And flexibility. So we think we have ways to accommodate some of the more advanced things that you might need for your school. Flexible class time scheduling(Lecture/Labs, period naming, etc…) and custom grading scales including weighted grading. And we put in features that are the only basis for other apps. 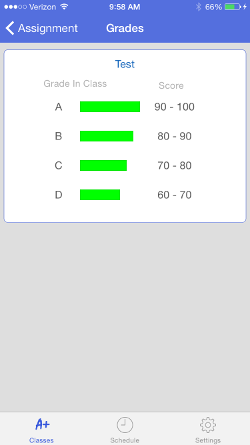 Want to know what you need on a test to keep a certain class grade? We have a screen for that…. This entry was posted in Birdsoft, iPhone, Productivity on August 24, 2015 by Administrator. So we have always thought our ‘Billing Hours’ has been a better product than the popular ‘Hours’ app. We realize that they have built out a great network to get it up and selling, have some friends at Apple, and do self promotion amazingly. But the fact is, their app is lacking in many areas. It has some neat effects and some novelty interactions, but it just doesn’t do everything that you might want it to do, and actually can be a little confusing for how ‘easy’ it is supposed to be. It seems to be missing several very basic features. So we thought, what a great time for us to do another of our FREE giveaways of our App, so you can see jut how much more usable an app can be when it has more of the features you need. Like sending an invoice! So give BOTH apps a try.. Give them a fair shake, and consider… Does their UI with some interesting shortcuts and interactions really make anything easier in the long run? Is having it a good tradeoff for not having the features that people that actually do track time might use the most? Or does the simpler app do what you need? I think you’ll agree that Billing Hours has more potential. And we have a new version coming that we won’t be adding monetization and steering towards Enterprise.. It will just have some neat UI tricks of our own, and requested features. So drop us an email on what you think, and what we can add…. Billing Hours on the AppStore. This entry was posted in Uncategorized on April 23, 2015 by Administrator. Let’s not call it a Post-Mortem… We just need a little life support. So Birdsoft is going part time as of October 13th, 2014. Well, Ive taken an iOS development(and possibly other flavors) job with a company that I’ve done quite a bit of consulting work for in the past. It will be a new adventure getting to create and work on some great mobile products. And my apps are mostly solid and mature at this point, so don’t think that part time means I wont be offering email support or squashing the bugs that do come up or adding anything. That will still hold a high priority…. I did make a few mistakes and focused on the wrong things a few times. I didn’t quite play the ever changing game right, it was like hitting a moving target(notice I didn’t use the word ‘evolving’). I did play it fairly right in 2012, but Apple already has changed the rules a couple times since then. And I could have done a much better job of finding and embracing the network of developers out there(and Press and Apple itself). But basically Ive determined that one of the only real ways of doing that would have meant spending thousands of dollars to get to THE developer conference(WWDC), solely to mingle and network. It was hard to justify…. but it turned out to be a mistake that I didn’t. Who charges that much, when the mobile stores used to throw the same types of things free, Oh yeah that’s Apple…. But really it is that Apple made the AppStore a mess. They seem to be cleaning it up a bit, but then I’ve thought that before. They simply made decisions that did not help the good middle of the road developers. They didn’t see us as that important. So now they have a trash heap of half-done apps that you have to dig through in order to find the gems. My biggest example. Apple actually championing the ‘race to the bottom’ price wise is the biggest mess. You don’t think they support that? I have an app that has made six figures, and I have a somewhat similar app that hasn’t even made 5 figures. The first is a paid app and the second is freemium. Guess which app they rush through reviews and show higher in searches? Yeah, the one that has more downloads, not the one that keeps me in business…. They have so many things structured like search, discovery, reviews, top charts that are all just skewed and broken. And the biggest mistake was promoting how many apps they had. 1,000,000 apps didn’t mean anything, when like 5% were any good. We’ve pointed most of these issues out since the beginning of the store, and yet some have gotten worse… It’s just a mess that I hope they are trying to fix and change their direction on…. Its a vicious cycle, reward the apps that are cheap or free with more downloads, but cycle them out as new ones come in, and hope enough people keep playing the game. Developers then don’t make enough money on apps(or make it all up front only), so those app don’t keep developer’s attention. So the developer then don’t improve them to what they should be. Now we have a lot of non-updated apps along with all the poor ones all sitting around clogging the system. So at least we have over 1,000,000 apps. Side Note: You know what I still to this day find: My apps with the most features still sell the best! Add to that the press being a ‘good ol’ boys’ club at this point that will push for and ‘love’ some pretty average apps because they met the developer once and that developer kisses up to them on Twitter or has been around doing Mac stuff, and some really good apps are getting passed over…. I’m around. Birdsoft is still going. But Im seeing some pretty big names dropping out of the fight, even today… and I feel like by doing this I just couldn’t quite pull it off fully either.. stinks! This entry was posted in Uncategorized on October 10, 2014 by Administrator. So what an interesting summer…. Well, we keep on churning out iOS development. We are currently doing a bunch of fixes and changes for Apple’s iOS8 and new iPhone sizes. We probably could have been a little quicker with our updates. But then again, Apple did hold out any information on those screens, because, well you know… secrecy… No, not a great reason, but it’s Apple. They don’t make mistakes… Well, except the mess that is iOS8 so far, and…. We did just come off of doing a huge project for a very high profile client, which we can’t mention because of Lawyer stuff… But it is an AWESOME app that we had a part in getting ready to ship for a top news agency…. So that got in the way of us shipping our latest big new product which is now about 95% complete, and work done on the new EXTREME AGENDA 5.0! So along with consulting, once we get these ‘fix’ updates out those 2 things are our main priorities. We have some great ideas and the good stuff that is in iOS8 made that list grow even longer, so… We hope to show you some neat new things very soon…. This entry was posted in Uncategorized on October 3, 2014 by Administrator. As a contractor doing iOS consulting I was looking for an app that could track my billable hours on projects and easily invoice the customer. And while there are some out there, a lot of them have long since been abandoned and have poor interfaces dating them back to early iOS, are too complicated, or require you to sign up for a service and pay a subscription. No thanks. So I set out to write a simple iPhone app that strips away some of the unneeded extra bloat, flowed perfectly with iOS7 and was built to expand if customers interact with us and want it to be more. And what I came up with is ‘Billing Hours’. And some of the expandability has already quickly happened as we’ve iterated. People asked to be able to import contact information as a client, and that is done. One reviewer, instead of emailing us, complained about not having next actions when filling out clients. Done. The app has room to grow and can be even more, as it is built to go to iPad and to quickly switch to using iCloud if we get enough support. So give it a try and let us know what you think with an email or help us out with a good review. 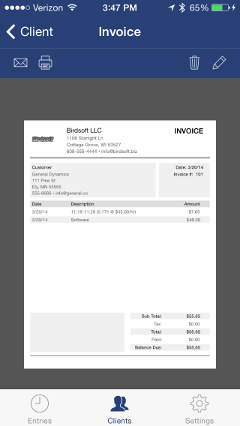 We want to help your track your billing hours quickly and easily on the go. This entry was posted in iPhone, Productivity on April 8, 2014 by Administrator. So we haven’t done an update of our current plans in a while… So here it is. We are currently juggling a few consulting projects, one being a pretty neat Android project, so we have opened up that can of worms… So along with juggling those, we have some pretty big plans for the coming months for our own products. We have just released updates to all of the Extreme line of products and Grid Calendar products, and are working to get those completely stable on iOS7-7.1 for those few people that are seeing issues. And then we plan on a big update to Extreme Agenda, hopefully dropping this summer. The first of these apps just dropped called “Billing Hours” and took less than a month’s development time. But it has features competing with and even above the top guys in that market. It is a time tracking app that allows contractors to keep track of and even invoice their hours and billable items. Check it out now at it’s low introductory price. We have some big plans and hopefully a big deal in place for a solution we have ready for Form Data collection and entry, right now targeting the utility world, http://www.utiliforms.com . We plan to expand on this as well in the AppStore, with a more standard version as one of our new “high end apps” coming soon. This entry was posted in Uncategorized on March 25, 2014 by Administrator.